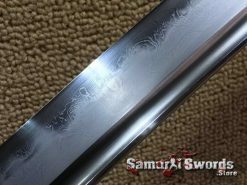 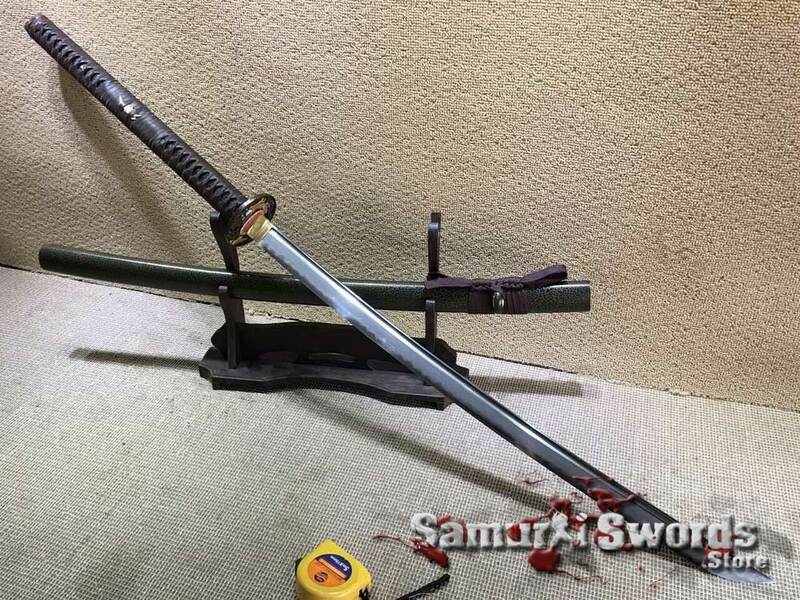 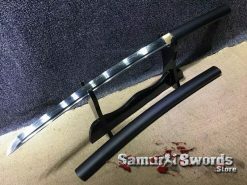 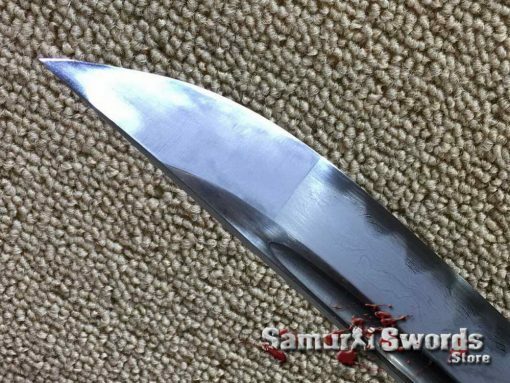 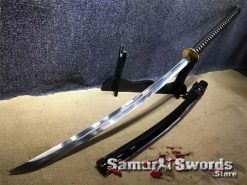 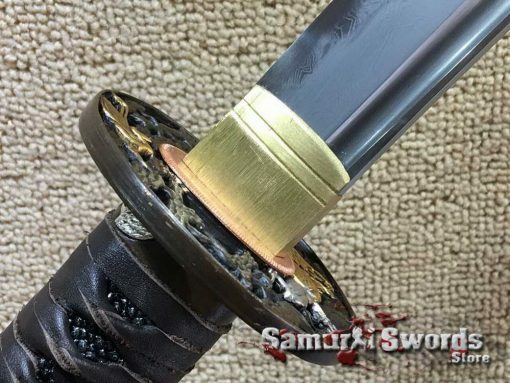 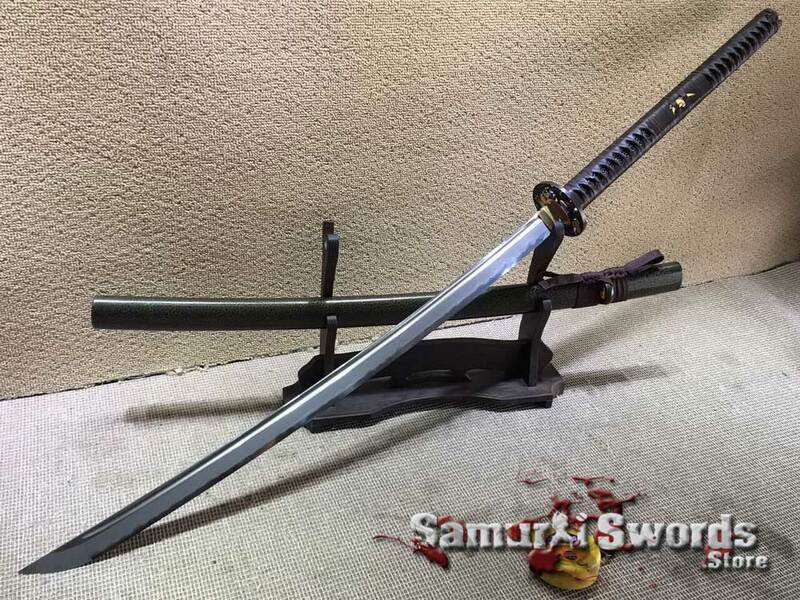 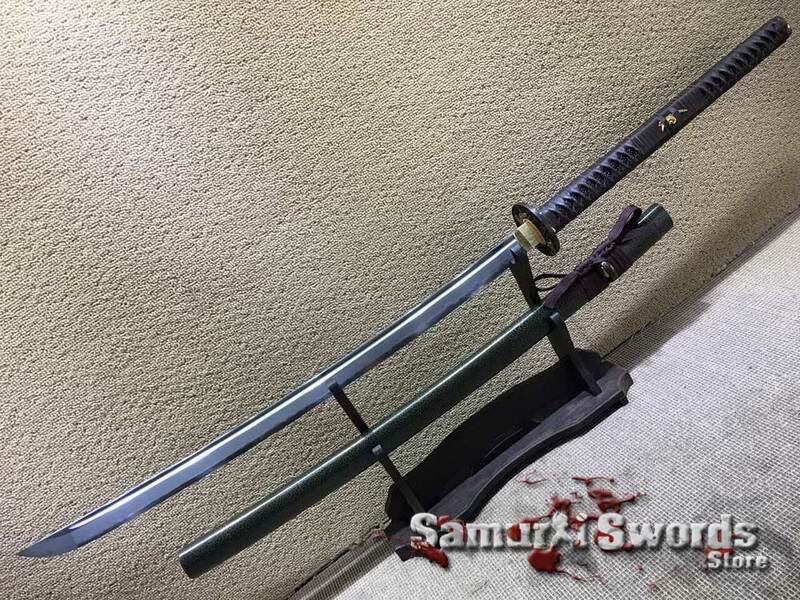 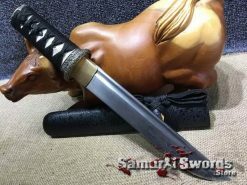 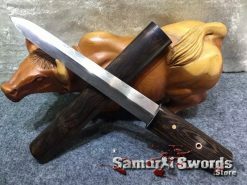 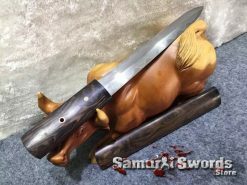 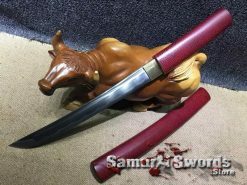 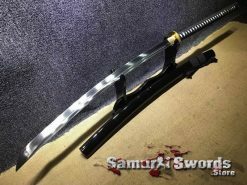 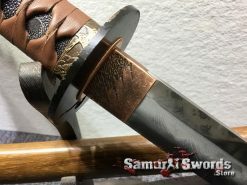 This is full tang and fully sharpened Nagamaki sword made from T10 folded and clay tempered steel that has undergone the hadori polish process which further enhance the visibility and beauty of the hamon line. The T10 steel has been folded 13 times which creates thousands of layers of steel and adds subtle Hada to the blade surface that look as a grain pattern. The blade also has gone through differential hardening making the spine softer than the edge which allows the blade to be extremely tough and retain a razor sharp blade overtime, while giving the sword more flexibility. 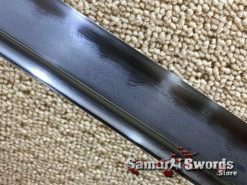 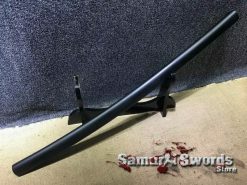 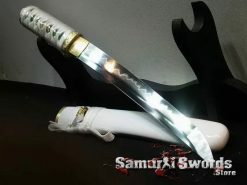 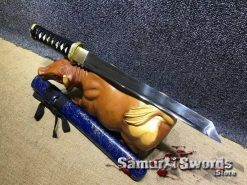 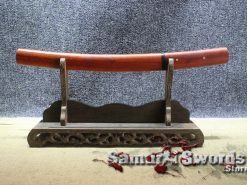 Its an excellent sword for target cutting such as tatami mats and bamboo poles. 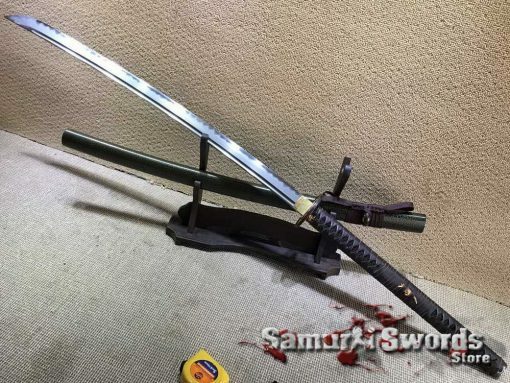 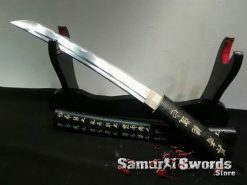 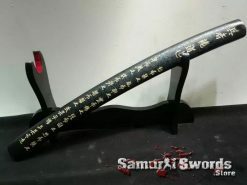 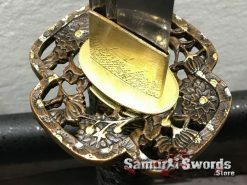 The blade of this Nagamaki sword features a bo-hi which runs down the length of the weapons blade and works by making this Nagamaki more lightweight and easier to wield. 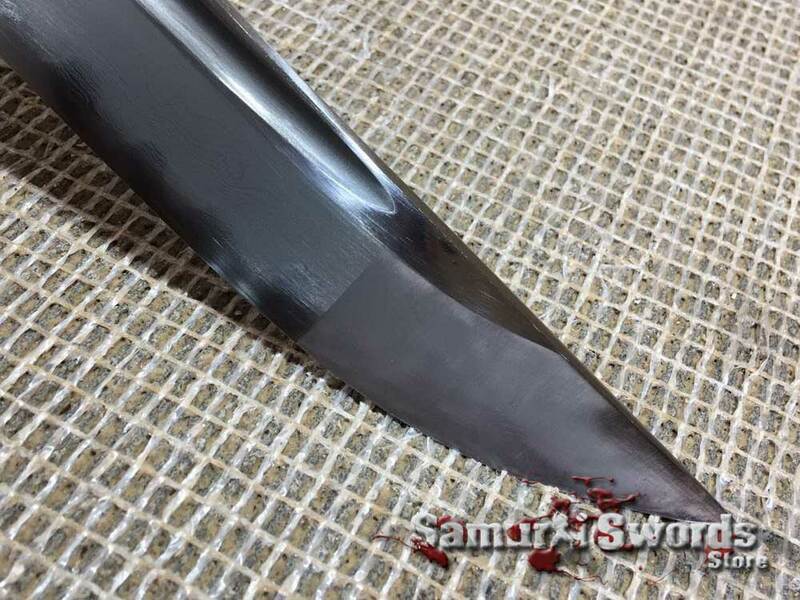 Sometimes, it is also referred to as the blood groove or fuller which also functions by altering the blades balance point while also ensuring good edge alignment. 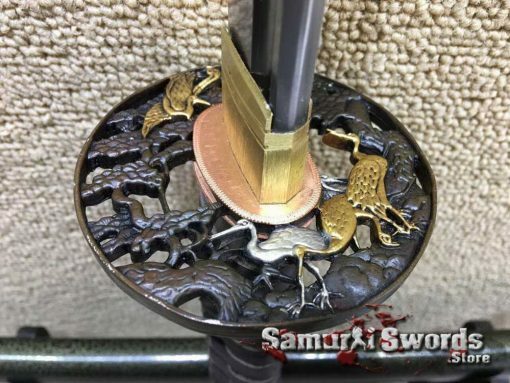 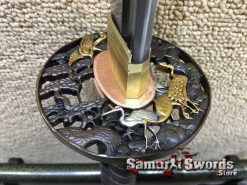 The tsuba, kashira, and fuchi are all made from high-quality copper and the menuki is made from brass. The menuki fits nicely with the black ray skin that covers the tsuka abd with the dark brown leather ito wrapped in Katate-Maki style (Battle wrap). 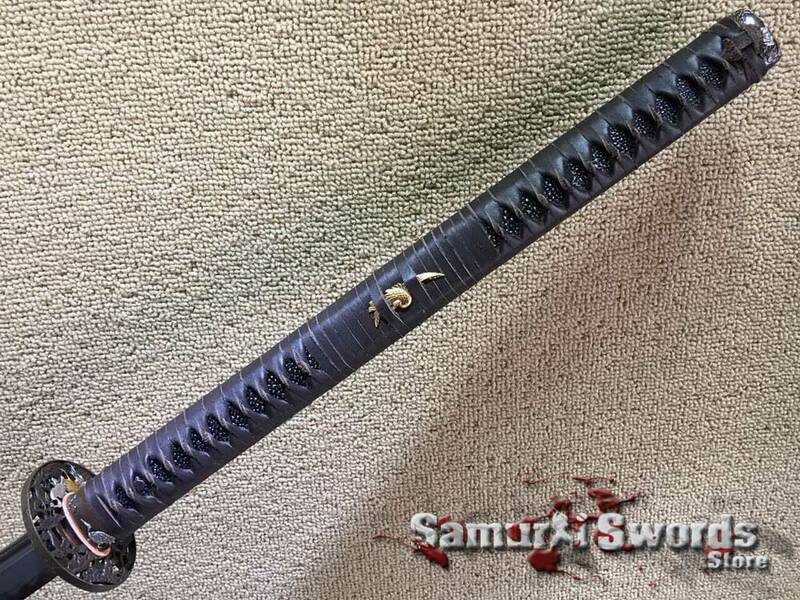 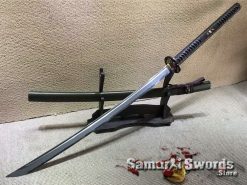 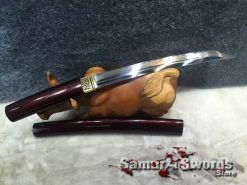 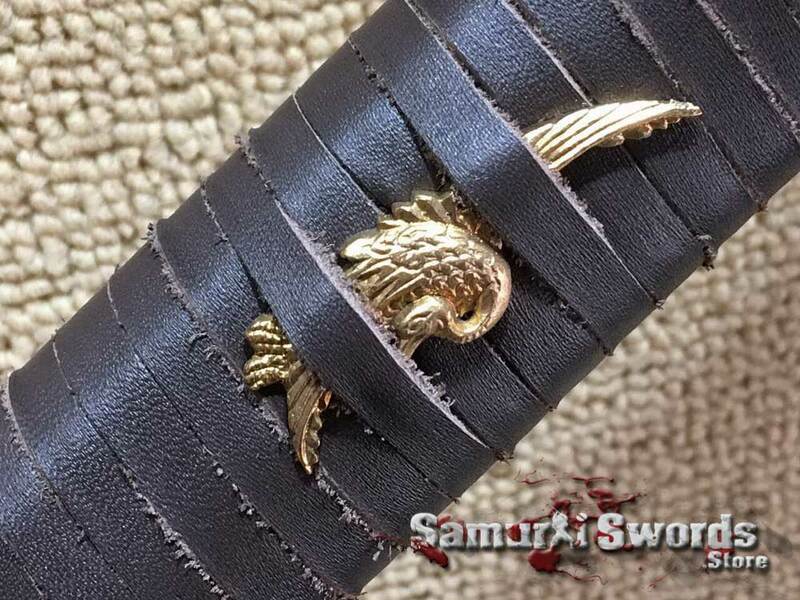 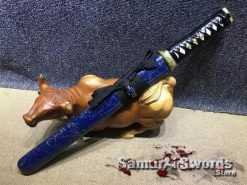 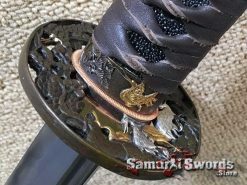 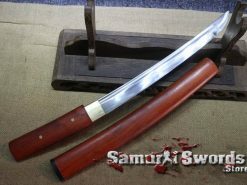 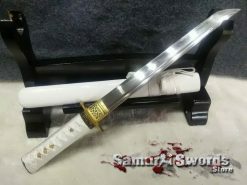 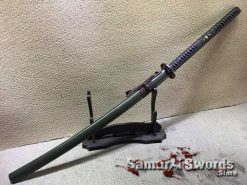 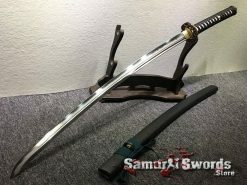 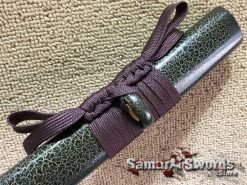 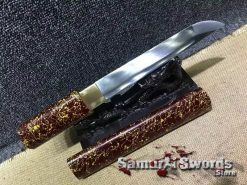 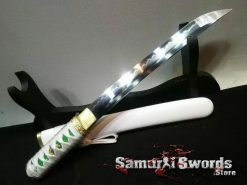 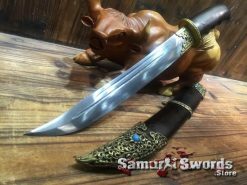 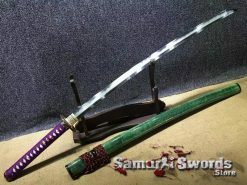 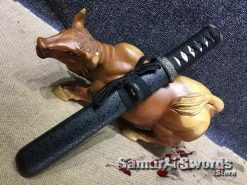 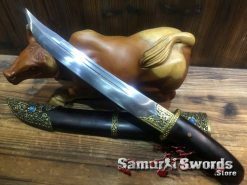 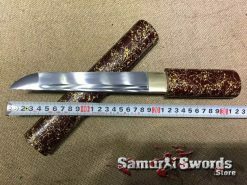 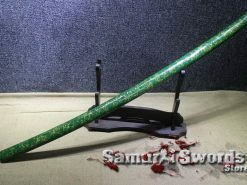 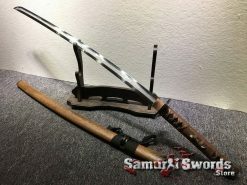 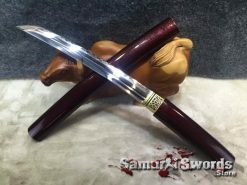 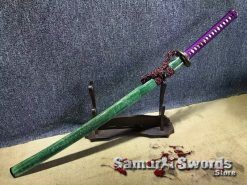 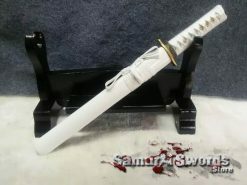 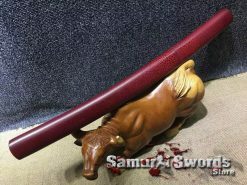 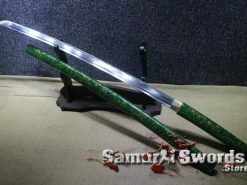 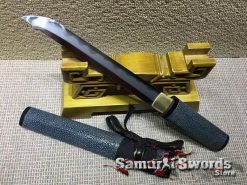 This Nagamaki saya is aesthetically appealing and made from synthetic green leopard leather wood and covered with burgundy rayon silk Sageo which definitely brings out the sword beauty and elegance; the sword comes with a silk sword bag to easily carry the sword around or to keep it when not in use. 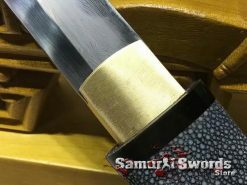 This Nagamaki has a blade length of seventy-three centimeters while its width measures around 3.2; its tsuka is quite lengthy at forty-five centimeters and the sword has a total weight of 1.92 kilograms.